Preggie Pops Variety Bag Discounts Apply ! A morning sickness remedy that works and tastes good! 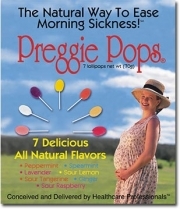 This variety pack includes all seven preggie pop flavors: Peppermint, Spearmint, Lavender, Sour Lemon, Sour Tangerine, Ginger and Sour Raspberry. It's great as a motion sickness remedy, too!